President Barack Obama’s new Mideast envoy called Wednesday for an end to Hamas weapons smuggling and a reopening of Gaza’s borders, seeking to strengthen the shaky cease-fire between Israel and Palestinian militants thrown into turmoil by new violence. Hours before George Mitchell met with Israeli leaders, warplanes pounded Gaza smuggling tunnels in retaliation for a Palestinian bombing on Tuesday that killed an Israeli soldier. After talks in Jerusalem with Israeli Prime Minister Ehud Olmert, Mitchell said consolidating the cease-fire is “of critical importance.” He said a longer-term truce should be based on “an end to smuggling and reopening of the crossings” into Gaza. Egypt and Israel have kept their borders with Gaza largely closed since Hamas seized control of the territory by force in 2007. Mitchell’s tour launches the first Mideast foray of the Obama administration. Obama said his envoy would listen to all sides to then craft a way forward with stalled Israeli-Palestinian peace efforts. Mitchell said that after finishing his consultations in the region and with Europeans, he will report to Obama and Secretary of State Hillary Clinton on his conclusions for the next steps. “The United States is committed to vigorously pursuing lasting peace and stability in the region,” said Mitchell, who met earlier Wednesday with Egyptian President Hosni Mubarak in Cairo, the first stop on his Mideast tour. A bomb attack against an Israeli military patrol along the border with the Gaza Strip killed an Israeli Defense Force (IDF) officer and wounded three others on Tuesday including one who was severely hurt. The violence started an Israel air attack Tuesday which was followed by more attacks Wednesday. The Israeli military vowed to respond harshly to any further attacks. Gaza’s Ramattan news agency reported three airstrikes at the Gaza-Israel border. Israel’s military said it struck tunnels used to smuggle weapons into Gaza at the territory’s southern border. 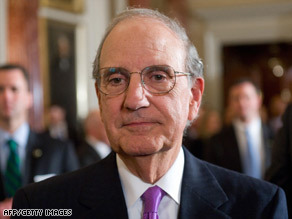 The actions from both sides — the bombing from Hamas and the air strikes from the IDF — mars the ten day old cease fire and complicates the mission of George Mitchell, President barack Obama’s designated Middle East envoy. Mitchell is on a trip to the Middle East now. Mitchell arrived Tuesday in Cairo, Egypt, where he thanked Egyptian leaders for helping to negotiate the truce. 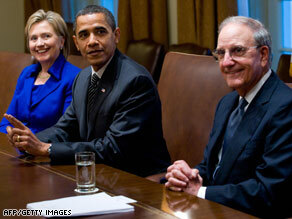 George Mitchell, right, meets with Secretary of State Hillary Clinton and President Obama on Monday. During his eight-day visit, Mitchell plans to meet with leaders in Israel, the West Bank, Jordan and Saudi Arabia before returning to the United States next Tuesday, according to the State Department. Israel responded swiftly, sending tanks and bulldozers into northern Gaza to plow up the attack site and launching an airstrike that wounded a Hamas militant “who was prominent in the organization accountable for the attack,” according to a military statement. Hamas said the Israeli strike injured one of its men as he rode a motorcycle in the southern Gaza town of Khan Younis. The border violence was the worst since the sides separately declared cease-fires on Jan. 18 to end a three-week Israeli offensive. Since withdrawing its troops, Israel has threatened to retaliate hard for any violations of the informal truce. One of its main targets is the network of tunnels used to smuggle arms, money and people into Gaza from Egypt but despite hundreds of strikes during the war smugglers resumed work after the cease-fire. President Obama was on Al-Arabiya TV telling Muslims they are not America’s enemy, envoy George Mitchell was traveling to discuss peace with all sides in the Middle East and former President Jimmy Carter said Monday that Israel will face a “catastrophe” unless it revives the Mideast peace process and establishes an independent Palestinian state. WASHINGTON (AFP) – US President Barack Obama threw his weight Monday behind Arab-Israeli peacemaking when he sent envoy George Mitchell to the region with a brief to “engage vigorously” to achieve real progress. Obama, promising to be more actively engaged in Middle East diplomacy than his predecessor George W. Bush, set the tone for the trip after meeting Mitchell who is due to visit Israel, the Palestinian West Bank and Arab states. In the short run, the trip is aimed at bolstering a ceasefire in the Gaza Strip — following a three-week Israeli military offensive — and tackling the humanitarian crisis there. NEW YORK – Former President Jimmy Carter said Monday that Israel will face a “catastrophe” unless it revives the Mideast peace process and establishes an independent Palestinian state. In an interview with The Associated Press, he said Arabs will outnumber Jews in the Holy Land in the foreseeable future. “If we look toward a one-state solution, which seems to be the trend _ I hope not inexorable _ it would be a catastrophe for Israel, because there would be only three options in that case,” Carter said. The third would be to give the Palestinians equal voting rights, and therefore the majority, he said. Carter spoke to The Associated Press as his new book, “We Can Have Peace in the Holy Land,” was released. You are currently browsing the archives for the Mitchell category.